So, you’re likely here because the title got you – making money through online surveys. Who doesn’t want to have an additional $100, $500, even $1,000 a month in their bank account? I know I sure do. With rising gas prices, grocery bills (seriously, trying to eat healthily is going to make people go bankrupt one of these days), rent or mortgages, and basically everything else that you love in life, it’s all expensive. Even that $5 latte likely sitting on the counter beside you will add up over time. The point is, life in today’s world is expensive. It may sound like I’m complaining (and maybe just a little bit), but it’s the truth. Take a look at some of the prices for everyday essentials to see for yourself. Instead of looking for the second, third, maybe even fourth part-time job, read this first – you can make money with online surveys. This is no joke. People can make a decent amount of side cash by simple doing surveys online. Companies want the opinions from people like you and me to help them improve their organization. It’s a win-win for everyone. You get money, and they get the much-needed feedback you’ve been dying to tell them. Seriously… you can make some solid cash. Now, don’t think you’re going to become some hot-shot millionaire by doing an online survey here and there. You’ll make money, but it won’t be enough for you to quit your day job. Look at online surveys as additional income that complements your primary income. You can use this extra money for investments, a savings account, to buy those shoes you’ve been eyeing up, or take a family trip somewhere warm to escape the brutally cold winter. The choice is yours because it will be YOUR money. So, have I convinced you yet about the awesomeness of online surveys? If no, go back to the top and reread it again. If yes though, let’s take a look at the ones that won’t scam you and will actually pay you real money. Inbox Dollars is a popular online survey site that many like to use. It’s free to join, easy to use, and a way for you to quickly earn money. If you actually enjoy taking surveys, you’ll want to add this one to your list. One of, if not the most known online survey company is Swagbucks. They’ve been around for quite some time and still have people constantly joining. With Swagbucks, it’s more than mere surveys. You can get assigned tasks in which you receive rewards upon completion. The rewards come in the form of Swagbucks (SBs). You can either redeem them as cash, gift cards, and even PayPal credits. If you’re looking for a straightforward way of taking surveys and earning cash, Survey Junkie is the one for you. Plus, there are over 5 million members, so you know you’ve found something good. Something neat about Survey Junkie is that you even get paid for answering the screening questions. Basically, no work goes unpaid here. Here’s the million dollar question – how do I become successful with those surveys listed above? Well, I have your back. 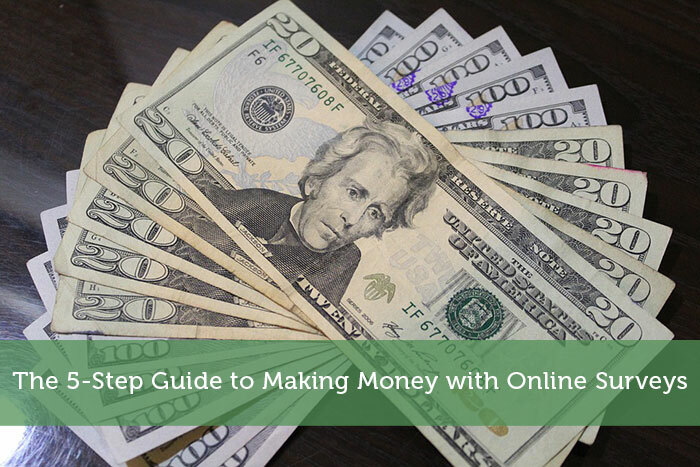 Here’s a 5-step guide to get you making money with online surveys. Something you’ve likely gathered is that you won’t get rich off of these survey sites, especially if you only sign up for one. You’re best to sign up for multiple survey sites (like all four listed above), to better your chances of bringing in a decent amount of money. I know it may be tempting just to pick random answers. The truth is, you have a better chance of earning more money if you take your time and be honest with your answers. Even if you think the survey is a joke, it means a lot to the company asking you the questions. Building up that relationship will only better your chances of more money. Some survey companies will assign you surveys based on your demographic. If you don’t keep your profile updated every time something significant happens in your life, you could be missing out on a whole new pile of surveys. Make life easier and keep your survey addiction emails separate from your personal or work email. It will help keep you organized and so that your personal account isn’t getting bombarded with tons of emails throughout the day. Your time is valuable. That means you shouldn’t be doing work for free. Make sure you get compensated with every survey you do. Scope out the highest paying surveys that you’re eligible for. If you have lots of time to spare, maybe going for those smaller paying ones isn’t the end of the world. So, go ahead, sign up for a survey website. See how much money you can make each month and how it will benefit your life.